HONOLULU – The Hawaii Department of Transportation (HDOT) notifies motorists that the left turn lane will be permanently closed on the Campbell Industrial Park/Barbers Point Harbor offramp (Exit 1A) from the eastbound H-1 Freeway beginning Tuesday, April 16, 2019, part of the Kapolei Interchange Complex, Phase 2 project. The left turn lane will be closed permanently for safety reasons. Due to modifications happening at Kalaeloa Boulevard, crossing lanes at this intersection is not advisable. 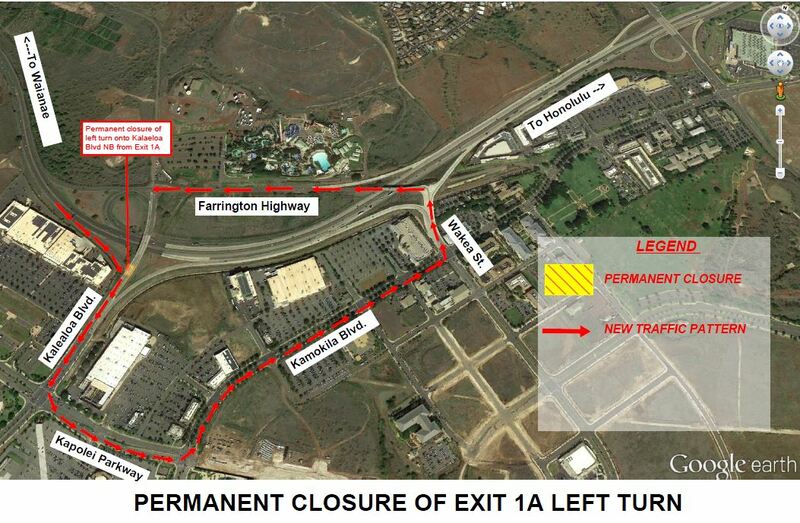 Motorists traveling on the H-1 Freeway will be directed to Kalaeloa Boulevard via the Campbell Industrial Park/Barbers Point Harbor offramp (Exit 1A) and may continue on Kapolei Parkway/Kamokila Boulevard, to Wakea Street and to Farrington Highway. See below to view a map of the detour route.